The right car care helps not only greatly to maintaining the value of a vehicle in, but also serves well as road safety. A clean car is perceived faster and through a clear disk you can see better. 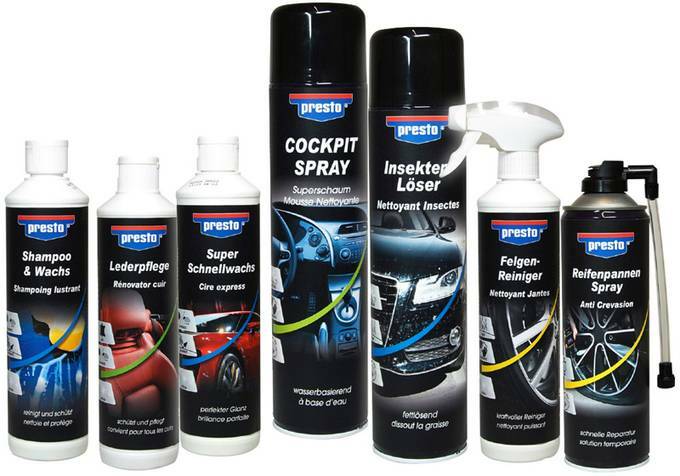 With presto Car Care we offer you a varied range of quality products in proven presto-quality! Special products for a variety of interior materials, such as Leather conditioner, water-based Cockpitspray or Textile cleaner, that ensure an optimal care and protection from premature aging. A high-gloss surface is the pride of every vehicle owner. All the time the paint, however environmental and mechanical loads is exposed. In order to protect the surfaces is regular maintenance is essential. The range is completed by selected cleaning and care products for wheels and tyres. Even in the event of a breakdown presto will not let you down - with the "presto tyre repair" the journey can be continued. Effective Car Care - For perfect shine and value!